Michael Pickens proves too strong Brisbane | Talking Speedway, Speedway news from around the world! 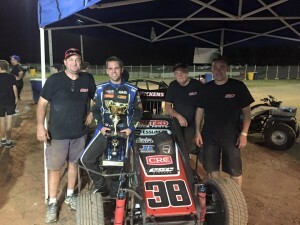 New Zealand’s Michael Pickens ramped up the rivalry between Australia and New Zealand with his win in Brisbane at the Queensland round of the World Midget Series. The multi Kiwi Champion continued his strong recent forms from the New Zealand rounds with a near perfect display over the 40 lap journey .Pickens well known and respected by Australia fans reminded us of his special talent in the mighty midget Speedcars. Whenever Pickens gets behind the wheel of a speedcar you expect a powerful performance .With three Americans and three of his fellow countrymen also had their minds on taking the win.Coming into the second night of Brisbane show Pickens sat just adrift of expat New Zealand Champion Michael Kendall on points after the rain shortened first night. Pickens raced to an early lead from pole sitter Tyler Thomas and the Kiwi were never headed for the duration of the race. Tyler Thomas looked like he may have an opportunity to press Pickens but with 6 laps to travel he was forced out .As good as Pickens was the standout on the night the 2013 POWRi Champion Andrew Felker .Felker was brilliant as he as he chased the lead .I would go so far as to say it was the best drive Felker has put down on any of his tours down under . Lap 37 Felker was just stunning with his run around 2014 USAC Sprintcar Champ Bacon and Australian Nathan Smee to grab second behind Pickens.With the race entering the final stages Pickens had to deal with a flat right front and the charge from Felker. When the flag dropped after 40 laps Pickens was first across the stripe followed by Felker and Nathan Smee. Smee overcame Bacon to win the battle for the final podium spot .After missing the first night Mosen and Williams charged into 5th and 7th with Brock Dean splitting the pair with his 6th place finish. The Archerfield track proved a problem for Brady Bacon and Leon Burgess had a shocker in the opening heat, both spinning twice and being removed the race officials from the heat race. 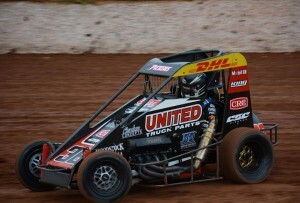 The next 2 round of the World Midget series heads down into the Northern Rivers to the Lismore Castrol Speedway this Friday /Saturday. 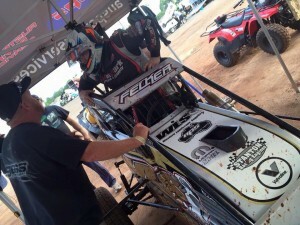 This entry was posted in Australian Speedcar Championship, Midget Speedcars, Powri World Midget Championship by admin. Bookmark the permalink.